Real-Time Biophysical Oceanographic Mooring "M2" has beeen maintained in the Bering Sea since 2006. 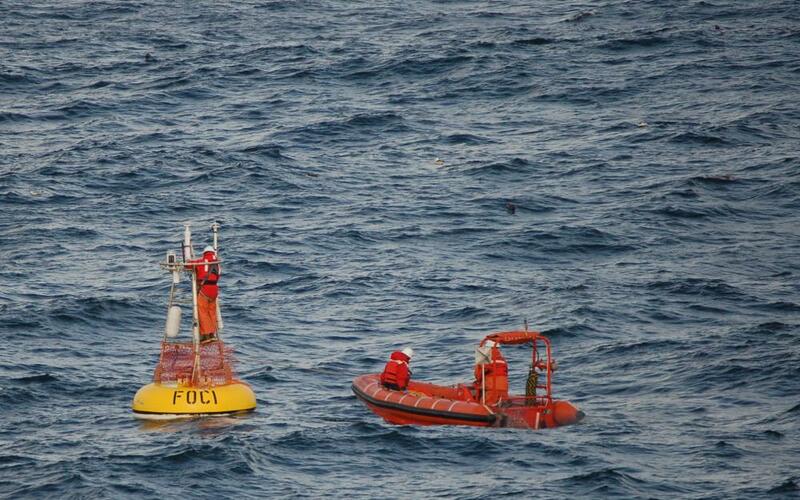 (BOEM), maintains additional biophysical moorings at three locations in the Chukchi Sea. These moorings, together with other long-term monitoring efforts and process studies, allow for a better understanding of mechanisms important to the marine ecosystem of the continental shelves of the Bering and Chukchi seas. Seasonal forecasts of ocean conditions are presently being developed and evaluated for the coastal waters from central California to Vancouver Island in support of NOAA’s Integrated Ecosystem Assessment program. The work is being conducted in collaboration with NOAA’s Northwest Fisheries Science Center. This project aims to provide 6- to 9-month forecasts of upper ocean properties, based on input from NOAA’s Climate Forecast System (CFS) and dynamical downscaling with the ROMS regional mesoscale ocean model. Forecasts of specific oceanic properties crucial to the nearshore and coastal marine ecosystem, such as upwelling, pH, mixed layer depth, and oxygen concentration, are anticipated with updates on a monthly basis. The projections of circulation and plankton MARINE ECOSYSTEM PMEL Themes distributions may also prove valuable for use in individual-based models of commercially significant fish populations. Interest has been expressed to expand this effort to provide similar information for other regions, such as the Gulf of Alaska and Bering Sea. The Arctic Ocean has changed markedly in the last decade, and changes are predicted to continue for the foreseeable future. The EcoFOCI group, in partnership with other federal agencies, plans to expand its investigations of the Arctic. Within the next few years, EcoFOCI scientists will co-lead and participate in a major synthesis of Arctic Ocean ecosystem research, continue and expand investigations on the Chukchi Sea, and participate in baseline fisheries studies in the northern Bering and Chukchi seas. The program will provide critical data for model evaluations. Work in the Arctic will be greatly enhanced by the development of new instrumentation. For example, working in partnership with its designer, EcoFOCI has helped improve an acoustic instrument (TAPS-8) that measures zooplankton abundance. This is important, because the patchy nature of the zooplankton populations makes them difficult to characterize, but these populations are critical to fish and are likely to change with Arctic climate changes. Council (which establishes fishing quotas) through the NMFS Science and Statistical Committee. EcoFOCI will continue to propose, evaluate, and modify indices of biophysical processes in an effort to improve prediction and reduce uncertainty in ecosystem forecasts. In addition, EcoFOCI will expand its contribution of the individual assessment chapters (Plan Team reports) to discuss how and what climate indices to incorporate directly into the single stock assessments. Through these predictions, EcoFOCI passes the results of scientific research directly on to operational use, to benefit the national economy.